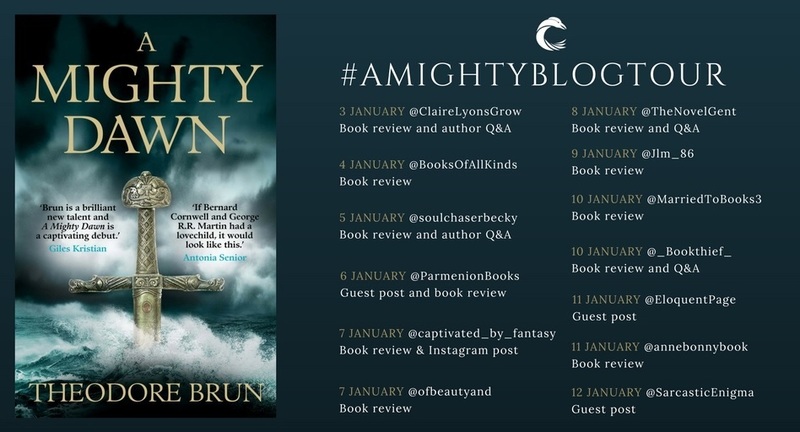 It is with great delight that I welcome Viking-age historical fiction author Theodore Brun to my humble hall of all things Vikingy – he is stopping by for a horn of mead on his blog tour celebrating the paperback release of his debut novel #AMightyDawn. I have had the honour of reading it and thoroughly enjoying it before its paperback release this month and before you find out my FULL review of the book I would like to take advantage of my blog guest and delve into the mind of the author and see what gold or dragons lurk there… we will do our best not to give away too many spoilers in the questions or answers – but if it piques your interest just order it and read it! As a life-long fan of all things vikingy since I discovered Bernard Cornwell I would like to know the how/where/when or even what/whom got you interested in Vikings whether it be their culture, history or mythology? I’ve been aware of all things “Vikingy” all my life. And aware, too, that as a half-Dane (my father is fully Danish), I somehow had a connection with them. But an interest and enthusiasm for the Old Norse world didn’t take off until much later. I read archaeology at university, which involved - amongst other things - studying the material culture of Scandinavia and the early Viking Age. But even that I found a bit dry. The ignition point really came through a CD (remember those?) I bought when studying for my legal exams: “Highlights of the Ring Cycle”. Now, I realise Wagner’s operas are a pretty unusual (not to say totally un-PC) portal through which to discover a passion for the world of Old Europe, as I call it – the Germanic world as well as the Norse – but that was in fact the case. The music of those operas blasted a big hole in my imagination which, being an enthusiast, I then filled with every Old Norse saga and mythological poem I could lay my hands on. We had Sigurd the Dragon-Slayer, Beowulf, the Havamal, the Saga of the Volsung, and of course the Prose and Poetic Eddas, to name a few. I think these formed the seedbed out of which A Mighty Dawn and the following books have grown. According to your book biography your grandfather is Danish – did having such ancestry ever influence your own interest in Vikings? My grandfather was a Danish immigrant to England in 1932. He was quite a force of nature and lived until he was 101, so he loomed very large in my life. And although we always lived in England, both he and my father always impressed upon me (and my brothers) our Danish heritage. Over the years I have spent a lot of time there. Even now I have a lot of cousins and friends in Denmark. So I would say, yes, it has had an influence because it has given me a great affection and appreciation of the lands of Scandinavia, in particularly Denmark. Though I couldn’t say that my grandfather or indeed my father passed on any interest in Vikings per se. Most Viking historical fiction I’ve read often involve a great army invasion, usually of Anglo-Saxon England, or some kind of Blood Feud between the different mini-kingdoms that made up Scandinavia during the Viking Age. Your novel is unique in that it stands out from this typical set up in that it focuses on one man’s life, experience and travels through early Scandinavia – Hakan, the son of the Lord of the Northern Jutes. What led you to Hakkan? What is his origin story to you? Was there a particular legend, piece of history or is he even based on a historical figure of the same name? I certainly didn’t think of A Mighty Dawn as a Viking story at first, not in the classic sense. Slaughter and pillage and all that. And I didn’t have a real interest in writing one of those. I think others have done it far better than I could, anyway. So, to answer the question, the seed of the whole series came from a lecture about an obscure English missionary in the 8th century, Saint Boniface. There’s an episode in his life when he chops down the sacred oak of the thunder god Donner (or Thor) in a dark German forest. Immediately I could see the scene in my mind, the conflict between old world heathenism and the new faith of Christianity, and I was intrigued. After a little more research about this guy, I found that Islam was also in the mix, and that this period of the early 8th century in Europe was one of friction along the fault-lines of these old and new worldviews, all of which came to some kind of climax, at least between Islam and Christianity at the Battle of Tours (Poitiers) in 732AD. I wanted to explore that world, but thought I needed a neutral point of view in order to do it. To me, that meant seeing it all through the eyes of a heathen from the north. But what would a heathen from Scandinavia be doing embroiled in a conflict in France between the Christian Franks and the Muslim Moors? What was that guy’s story? A Mighty Dawn and the rest of the Wanderer Chronicles is the answer to that question. So effectively A Mighty Dawn itself is Hakan/Erlan’s origin story. I think in conceiving and writing it, I have been influenced by some of the older source material – in particular the Saga of Volsung and to a lesser extent the legend of Beowulf, although I have tried to put my own spin on it. Besides this, in the course of writing it, I discovered another piece of research that had a profound effect on the story. This was a paper by a historian called Neil Price about the so-called Dust Veil of 536AD – an actual meteorological disaster which ripped apart the fabric of Scandinavian society during the sixth century and left an indelible scar on the psyche of the Norse peoples. He argues that this might be the basis for their concept of the Ragnarok – the doom or twilight of the gods: The end of the world as they knew it. I used that idea to form the central conceit of A Mighty Dawn. This book has some very dark, sinister and even supernatural undertones – and the reader will discover this from within the first few pages. Overall the book is a brilliant blend of horror set in early Scandinavia and you show well the beliefs, superstitions and indeed age old fears of monsters that people alive at the time held. Did you decide early on that such elements were going to be involved in Hakan’s story? Or was it a later development? Did you intend to deviate slightly from historical fiction? My original intention for A Mighty Dawn was that it should be mythic but set in the real world. To that extent, some of the boundaries between what you or I might accept as reality today, and between what you might define as historical fiction and fantasy fiction, were deliberately leaky. I wanted to play around with the Old Norse worldview, the edges of reality and the possibility of the supernatural. I think this is very characteristic of that world and is intrinsic to its appeal. There is beauty, there is strangeness, and, I think, there is some truth inherent in the soul of “northernness” – if I can call it that. Of course, it’s a world somewhat lost to us now. But for example, shamanism and in particular the close association between shamanism and warfare was absolutely at the heart of the way the peoples of the north made sense of the world. The figure of the god Odin himself is typical – he is at the same time warrior and shaman and poet. A Mighty Dawn explores all those aspects of that world. But looking forward in the series, my intention has always been to move from myth to legend to history. So you can expect the series to become more “historical” and less “fantastical” as it goes along. This reflects the idea of Old Europe emerging from the more shadowy epoch of saga and myth into the comparative light of the early medieval period of history. Whether this works or not, I’ll let you be the judge. But for example, the second book, A Sacred Storm, which is out in June, centres on a battle that took place at some point in the 8th century. Is it history? Not quite. It sits more comfortably in the realm of legend. But something like it undoubtedly took place. Hakkan goes on quite a journey throughout the book, emotionally, psychologically and physically. I as the reader found myself absorbing his experience of travelling so far on foot or by horse through some very stark, harsh and almost back-breaking landscapes and terrain. As he journeys North. How did you research the routes Hakan takes? Are they set in genuine real locations in what is now Sweden/Denmark? Have you ever been to the locations yourself? Hakan’s story begins in northern Jutland, and in fact I was up there on a research trip to get a sense of the landscape when the main skeleton of the story that takes us through the first two books came to me. So yes, I know Hakan’s homeland quite well. And then, in 2012, I did a bicycle trip from Gothenburg in southwest Sweden up to Uppsala, the ancient royal seat of Sweden north of Stockholm, which features heavily in the second part of the book. The ride took about a week. This gave me some idea about what Hakan would have had to go through, though of course the landscape would have looked very different in his time. But it was useful to stand in a Swedish forest and let my senses absorb everything around me. And also learn that the topography of southern Sweden is not that extreme. That part of Sweden is mostly lakes and forests - but even that is useful to know! As for the sense of the hardship of travel – I know this well. I used to be a lawyer and quit my legal job in Hong Kong in 2010 in order to jump on a bicycle and ride the 10,000 miles back home to England. As you can imagine, this experience has proved invaluable for writing A Mighty Dawn and the rest of the Wanderer Chronicles. There were plenty of backbreaking landscapes, moments of utter exhaustion and despair and loneliness, as well as many thrilling and euphoric moments too. Believe it or not, the caverns of Niflagard are based on a real place that I visited during that trip. In the city of Guilin in China, they discovered a vast underground limestone cavern called the Reed Flute Cave which you can go down into, and which is eerily lit with dim blue lighting. It’s very evocative and was extremely useful as a starting point for the horrors of Niflagard. The book is left with an open ending which presumably means there will be a sequel following the consequences of Hakan’s adventure in A Mighty Dawn – are you still writing it? Do you imagine Hakan’s tale becoming a trilogy or longer? Yes. The sequel, A Sacred Storm, is already written and will be released in June 2018. And happily, my publisher Corvus has just signed me up for books 3 and 4 in the series too. At the moment, I have in mind five books. But we shall have to see how the story grows. What are you like as a writer? Have you always enjoyed writing stories? If not how/when did you start? Did something or someone inspire you? Have you written other tales before A Mighty Dawn? And what is it about A Mighty Dawn that made you take on the challenge of getting it published? I have always loved the written word and writing, but I never considered myself a storyteller until I had the idea for A Mighty Dawn towards the end of 2009. Until then I had not written a word of fiction since my school days, but as the idea grew I felt compelled to give it a go. In a lot of ways, it was an exercise of insane hubris to give up a legal career and begin writing solely on the basis of an idea. All I can say is, so far so good. Just about! Whilst writing A Mighty Dawn, I have also written a few other short stories and read a lot about the craft of writing. So I am still learning. But without being overly dramatic about it, I think writing is my calling. I absolutely love it. For a long time, when I was a lawyer, I was always looking to the left and the right, stewing over whether I should be doing something else, I just didn’t know what. These days, I only look ahead at the other stories I want to tell. 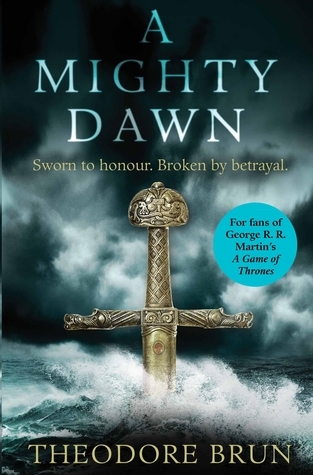 I’m obviously delighted that, as my first novel, A Mighty Dawn has now been published. But when I was writing it, I had to keep telling myself that even if it was never published, in order to be a writer, I had to write a first book. So in that sense, nothing I was writing was wasted. That idea kept me going through some long, dark periods of doubt, I can tell you! What was writing A Mighty Dawn like? Was it a challenge? Did the story come naturally to you? Did it require more research than you thought? Did you already have the essential self-discipline of a writer or did you have to develop self-discipline as you wrote? It was like setting out on a journey, about which I knew next to nothing and with no real idea of where it would lead. Before I began I had the bare bones of the story, so at least I had a plan. But I had no idea that I was trying to fit far too much story into one book. I thought it would take about three to six months. In the end it took nearly 20 months just to do a first draft. I’ve since discovered I had actually written two books in that time! And I then spent another year or more rewriting the first half into a stand-alone novel. It has been a massive challenge – perhaps the biggest of my life. But totally worth all the sweat and tears. To some extent the story has come naturally, but only in bursts. And the story evolved a lot in the rewriting. I have had some great sounding boards along the way, first in the shape of a freelance editor, then my agent Charlie Campbell and finally Sara O’Keeffe, my editor. (Not to mention my wife, Natasha, of course!) As a debut novelist, it’s taken longer to write this novel than I hope any future books will take, just because process is a huge part of it - for me at least. And that has taken a while to figure out. Fortunately, I did have the essential self-discipline to churn out the wordcount, day after day. As for all writers, procrastination is the enemy. (The prospect of writing creates a sudden need in me to clean absolutely everything in the house.) I did find procrastination easier to overcome when I was a bachelor living on my own in a spider-infested cottage in Norfolk. However, in 2014, I met and married Natasha. We have two girls now – a baby daughter and also my teenage stepdaughter. I’ve since discovered I need a lot more self-discipline to fit my writing around our family life these days – but I’m not complaining! We have books everywhere in our flat. Bags full of books, shelves overflowing, books strewn about our bed. Sometimes I even read some of them. My writing space varies. Technically my study is not my own at the moment. My desk is in my daughter’s nursery. So my area is rather constrained. My desk is quite small (but perfectly formed), with a very low desk-lamp. I have to be in a darkened corner staring at a wall. No windows in view to distract me. Sometimes I work at the London Library on St James’ Square, where they have a lot of useful material for research. I love hiding myself away between the shadowy book stacks at the back of the building where no one ever comes. The smell of old books is inspiring. What books did you use for your research and how did they help you write the novel? Well, the books I read are too numerous to list, but I will pick out one for special mention. The Viking Way by Neil Price was completely central to my approach to the old Viking world. He describes brilliantly the Old Norse mind-set and their way of understanding the world. This was vital for getting inside the heads of the characters. But it was also fascinating to see the linkage between shamanism and the violence and warrior ethic of the Old Norse world. One other less obvious one was a book on hypnotism, which I used for the scene when Hakan/Erlan and Kai first encounter Grimnar the seidman. This was useful for creating some ambiguity about the magical elements in this scene. Arguably there are two interpretations of what is going on – so the reader can believe what he wants to believe about it. That was the idea, anyway. What time did you find was best for you to write? Are you an early bird or a night-owl or a bit of both? When you aren’t writing do you ever find time to read for pleasure, not research? If so what kind of books you enjoy as a reader? Do they match the genre you write or are they complete opposites? Yes – I definitely make time for reading for pleasure besides research. I tend to read whatever grabs my interest and I don’t stick to my genre. Some books that have made a big impression in 2017: Baudolino by Umberto Eco; East of Eden by John Steinbeck; The Party by Elizabeth Day; Giles Kristian’s God of Vengeance and Justin Hill’s Viking Fire – to name a few. I also devoured an Agatha Christie in one sitting, which was fun. And I’m a big fan of audiobooks too. I’ve been listening to Outlander by Diana Gabaldon, which is beautifully written and beautifully read. Some writers say they always put a bit of themselves in the characters – do you agree with this? If so which character has a bit of Theodore and can you explain why? I don’t see how you can avoid it since all of the characters begin in the author’s mind, even when they are recreations of genuine historical characters. But of course that’s just a starting point. It’s exciting when a character takes on a life of his or her own. I think Hakan probably resembled quite a serious side of myself and was more like me in the very first draft. But he has evolved a lot. He’s much braver than I am for a start. And much more angry. But his experience of having to set out on a long journey with a wounded heart definitely echoed my own, and his struggles with overcoming loss. On the other hand, a character like Kai comes from a more irreverent and clownish part of me, I suppose. But he, too, took on his own life. It’s definitely one of the joys of writing. People assume that writing is a lonely business, but at the end of a long day’s writing, I feel like I have spent time with other people no less than if I worked in an office. That probably makes me crazy, but so be it! I’m going to be a bit biased here as a Librarian and ask as a child, teenager or adult if you ever used your local/central library/school library? If so how did it help you get into books or learning in general? Do you have any fond memories of using a Library? Do you ever take your children to visit the library? I used my school and university libraries a great deal through my childhood and growing up. Indeed, one of my abiding memories of my student days is going on the hunt for books around the book stacks of the University Library in Cambridge. (I think I found a lot more books than I read, but still.) As an adult I have used the British Library a fair amount for research and also the London Library (for which I have to pay a subscription). But I have also used local borough libraries elsewhere in London too. Many best-selling authors all support various calls to the Councils and Government to stop the constant cuts to Library Services, Staff and Funding. What is your personal opinion on the role of Libraries in today’s society and would you like to see Libraries existing for future generations? Absolutely. I can gaze at a shelf of books in the same way others might gaze at a painting or a sculpture. I am fascinated by books and am always delighted when these are readily accessible to the public. I suppose the role of libraries must be changing with the advent of all the instantaneously available information on the internet. But I don’t imagine books will ever be completely redundant. At the end of the day, a book is a very physical thing, and reading one is about more than just absorbing the words on the page. I think it would be a disaster if future generations were not able to benefit from the existence of good quality and well-serviced libraries, as we do. Your debut book has received some astonishing praise from other best-selling authors and reviews. Antonia Senior has described you as the ‘lovechild of Bernard Cornwell and George RR Martin’ and Jon Wise has envisioned you challenging Giles Kristian for the Viking Crown. How did you feel when you first read their comments? Does it add any pressure on writing the sequel? I’m hoping Antonia was referring to the book as their lovechild and not to me personally. The mind boggles! No – it is incredibly humbling and gratifying to receive praise like that. Giles is the master of the genre for me – his writing is so evocative and brim-full of the “northernness” which I described earlier. (And is often very funny too.) I have been inspired by all three of these writers at times, and I feel we all lie in a tradition that runs back through Tolkein and C.S. Lewis and Wagner and many other writers and artists and musicians all the way to the creators of great sagas like Beowulf and the Eddas. I guess I’m proud to add my efforts to the already long list. As for the sequel, it is all done now and I’m very pleased with the final draft. I hope it will be at least as engaging as A Mighty Dawn. But you’ll have to read it in June and see for yourself! Thank you very much for your time answering our many questions Theodore! We look forward to getting our hands on the sequel! If the Q&A above haven't aroused your curiosity about his book read on for my full review. "A Mighty Dawn is one heck of a mighty debut and brings a freshness to the Viking Historical Fiction genre with a dollop of darkness, a sprinkling of tragedy, a pinch of paranormal and a packet full of drama. The prologue breaks the mold from the first three or four pages and instantly grabs the reader by the neck and pulls them head first into a world where the superstitions and beliefs of the vikings are as real as the kiss of an axe blade or a lover. It is in fact set in the early days of the Viking Age, you don't witness a single invasion of a foreign land BUT you get to witness the troubles faced by the noble family of the Jutes in early Denmark during the 8th Century. At first the trouble seems average, perhaps day-to-day, that of the son feeling the pressure to live up to his ruling father's honour, of the girl he loves and whom loves him but is not meant to, of rivalries between ruling families and the struggle to be rule independently without paying homage to a distant King. There is also an attack and counter-attack involving long ships and storms and of course ultimately battle. However don't get too comfortable for the true tragedy starts to unfold as past lies, actions and secrets come forth in a tangle and sever bonds of love and blood alike. Causing a prominent son to disavow his own family, homeland and his past identity as he begins an epic journey, almost Homer/Odyssey in scale, to forge a new life with a new identity. He meets good and bad folk along the way, making enemies and establishing friendships as he travels through terrain high and low, through snow and ice, by horse and by foot, always at risk of danger from people, animals, weather or illness. Endlessly and almost bravely heading north in search for a great lord he has heard of, to whom he can swear his sword, name and life too and ultimately escape the trauma of his past. The description and experience of this journey is gritty, brutal and honest. As a shadow companion the reader will feel the hunger, thirst and fever, the cold, and witness the daunting landscape. The journey does eventually end for this lost son and his one friend, a young thief he took pity on in a village. They find themselves at the hall of this great and famous Lord in a beautiful and rich realm. But as in the best stories there is horror behind it all - in the form of Darklings, mysterious creatures or beasts that have begun to leave the dark forests to hunt or kidnap the folk. They have already sewn fear among the population by murdering the King's first born son yet no tracks can be found for any of the sporadic killings. All that is left is blood, sometimes bodies. Again this is where Theodore's storytelling shines for he shows the deep fear and superstitions of what the presence of such beasts and deaths signifies to these pagan people through different characters. The Lord declares them simply savage creatures and encourages loyal men to hunt them down, but his second wife with her rune castings urges sacrifices to the Gods, human sacrifices and his remaining son proves only hotheaded to wage war upon their enemies supernatural or not. Despite the Lord's best efforts tragedy strikes twice when it emerges that his one and only daughter from his first wife has been kidnapped by the Darklings and this time they have left tracks. Soon begins a contest of wills between the Lord, the Wife and the Son over what action should be taken. A decision is only made following the cryptic message in another rune cast that alludes to a stranger, a lone warrior and so the Lost Son is called upon to track the Darklings whilst the King brings up an army behind. This for me is where Theodore truly reshapes the typical viking historical novel, with a new Beowulf-esque drama of a warrior vs beast to save a realm and earn renown. But this time he adds a fresh touch of the supernatural and horror to the quest. For Theodore will take the Lost Son and indeed the Reader to some truly dark, grotesque, hellish places that would make any warrior wish to be somewhere else. It is only in the true end of the book that the reader will hopefully realise like I did that the entire story is one of Consequences and although a hero does emerge at the end and the enemies are slain... fame does not always guarantee friendship, and actions of others during the strife and fear of the Darklings attacks, brings new tragedy to the Lord's household...things are very far from peaceful or from settled..."